I’ve said it many times before, and I’ll say it again: the volume HUD in iOS is a ridiculous mess, and it’s in need of a facelift. A plethora of jailbreak tweaks in Cydia can help with the situation, but after trying a new release called Castro by iOS developer candoizo, I’m convinced that this just might be one of the best looking alternatives to date. As shown above, Castro doesn’t just relocate the volume HUD to the Status Bar or somewhere else on the screen like most other volume HUD tweaks do. Instead, it takes what Apple already gives us in the center of the screen and updates the look and feel. Castro won’t be for everyone, especially those who want the volume HUD somewhere out of the way for video-viewing and gaming, but if you never actually saw the volume HUD’s placement as a problem and only disliked how it looked out of the box, then Castro is an excellent way to change things up. As shown above, Castro is both aesthetically-different and intelligent. If you’re playing music, the tweak displays information about your song and the app it’s playing from within the volume HUD interface. If no music is playing, you’ll see an updated illustration for the ringer volume instead. These options will change on the fly without the need to respring your device, which is sure to be convenient for anyone trying to get the right look and feel. I particularly like that you can theme the volume HUD based on Night Shift or manually select your own colors, and the fact that it works with the modern Noctis tweak is a slick bonus that earns the tweak some brownie points. Castro is a solid release, and if you’re interested in trying it, the tweak can be downloaded from Cydia’s BigBoss repository for $1.29. 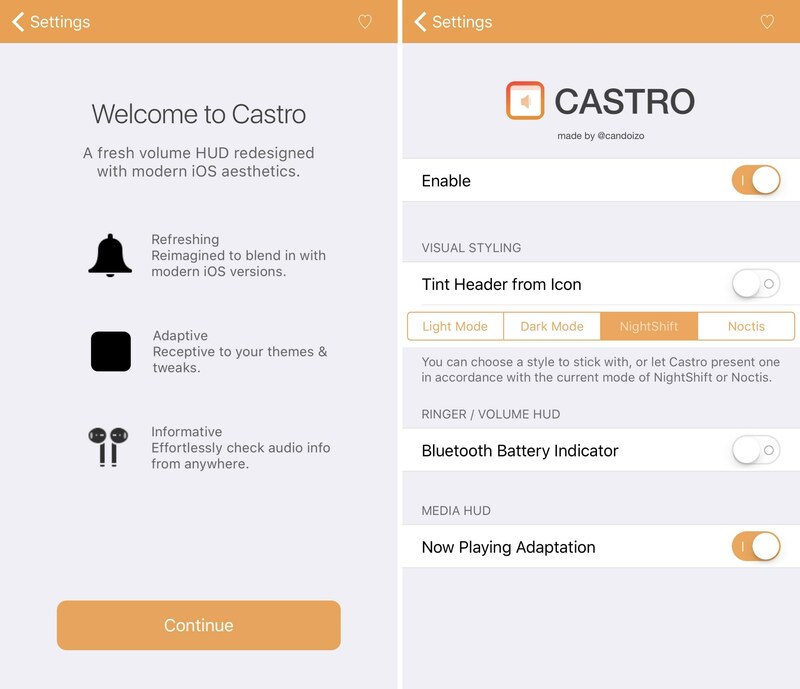 Castro works on all jailbroken iOS 10 devices. Do you like the updated look and feel of the volume HUD after installing Castro? Share in the comments section below!